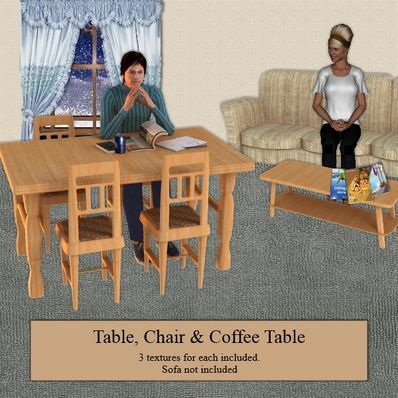 Table & Chairs for use in Daz Studio 4. Thanks, this is perfect... just what I was looking for. Already have several of this type of furniture, but one can never have enough styles, so this will be a welcome addition to my collection. It will see a fair amount of use. Thanks! I like that. Thank you so much. Thank you very much. These are awesome example of wood tables and chairs. I love them. Love the different patterned seats, great desk set!!! TKU!! You are a amazing artist, thank you so much.. You are very kind person. May you be blessed with goodness. These furniture sets are brilliant, Will.. Thanks very much.. Appreciate it..
Nice and homey furniture, thanks!